Since I had no real clear ideas, I just added some salt and pepper, a cup of water and dropped the chicken into my big cast-iron pot, put the lid on and slid it into the oven. Then I thought of the Carolina Red's and the rest is history. Traditionally, a Frogmore Stew has shrimp, but being landlocked, I have to plan way ahead and not simply "over" to ensure seafood. 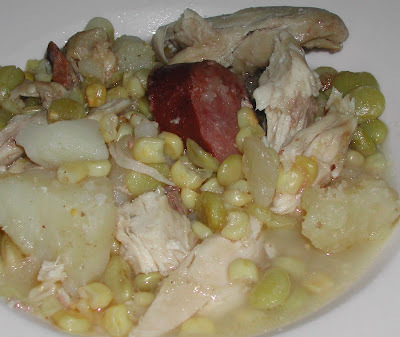 While the chicken cooked I peeled potatoes, cut off corn, and grabbed the frozen lima beans. I didn't really need to season it much as the spice in the smoked sausage added plenty to the dish. Here is my "recipe" for Frog More-or-Less Stew . Remember it is a "planned-over" recipe or a basically an "un- planned-over" leftover recipe so use your judgment and imagination. Add peeled potatoes, corn, lima beans, and sausage. Remove the chicken from the pot, allowing it to cool a bit. Remove the meat and return the meat to the pot. Season with some extra hot sauce if it's too mild for your taste.